This week I was hired to do a stage show at the AOCC Commissioning Ball, at the W hotel on Sentosa. All guys in Singapore are called to serve the nation in the army, doing whatever guys are supposed to do best. At the end of the 2 year term the officer cadets have a ball. I was part of the event entertainment doing 2 sets of 20 min during the dinner. The MC that night was one of the local celebrities Chua Enlai. He is a Singaporean stage and television actor, best known for his work on the Mediacorp Channel 5 sitcom The Noose. The closing act was Hossan Leong a Singaporean TV Host and comedian. I enjoy other event entertainment acts, because it gives you the opportunity to see how they structure their show and how they communicate with the audience. Since I am a foreigner in Singapore I always try to find out what works and what doesn’t. I still have a lot of work to do for my stage act and it is not about the tricks. 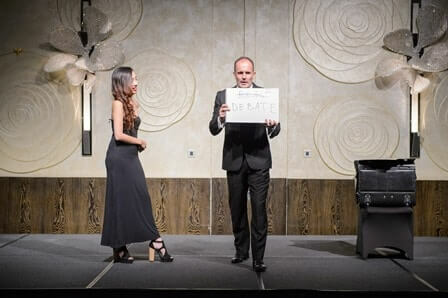 Last weekend I did a show at private event at the Marriott Hotel in Singapore. It was a solemnization of marriage. The audience were all Singaporeans and some selected guests from China. When you work as a Magic performer Singapore you almost always have a mixed bag of people. Since I only speak German, English and some Japanese I face sometimes the challenge to have a table, like in this case where nobody speaks the language. For this reason I added a couple of effects to my my performance repertoire that are visual and do not rely on language. Sure the performance of these pieces is better when you can communicate but sometimes this is not possible and I see it as my job to be able to still entertain the clients.